There are three options available for the Displays on our European Bike range. Not all options are compatible with all bikes. The operation of the LED system provides adjustable SPEED in five selectable steps. Level 1 powers up to 6 mph, whilst level 5 powers up to 15 mph. Each level operates at up to full power, and power cuts out at the selected speed level. The operation of the Mini LCD system has four selectable POWER levels. Level 1 gives 25% of the power, level 2 – 50% up to level 4, 100% power. Speed range is from 0 to 15 mph in all levels. This is available as an easy to fit upgrade for ALPHA, OMEGA, QUINTESSENTIAL & SIGMA. 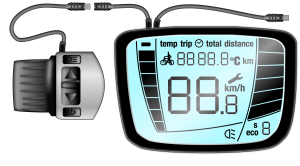 The Centre LCD system provides five selectable power levels in the same way as the Mini LCD but the larger display and fitment at the centre of the handlebars makes it easier to read. The controls are on a separate unit which attaches to the left handlebar as per the Mini LCD. This is available as an easy to fit upgrade for ALPHA, DELTA, OMEGA, PERDU, QUINTESSENTIAL and SIGMA models. These display options are available as a dealer fitment either at the time of purchase or as a later upgrade. Details of the operation and fitting manual are available to download. You can download the Display Options Manual to see how each type of display operates and how the Dealer will fit the system as an upgrade to your bike.